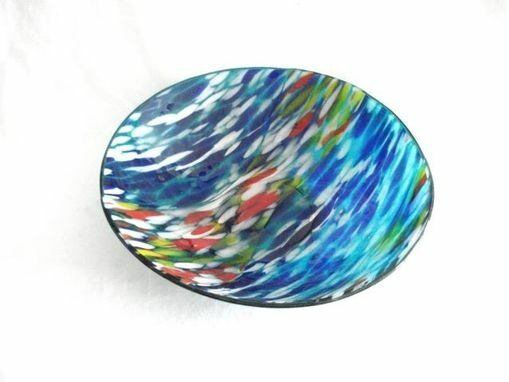 14" wide x 3" inches deep bowl hand made by me, Rachel, in my Cape Canaveral studio. I used 2 different colors of glass but the same pattern, one in blue and white and one in red,yellow and white and layed them over teal green, and then fused this together in my kiln. A second firing was done in order to shape my newly created sheet of fused glass into this bowl. Finally, I signed the piece. Although my pieces are very sturdy,dishwasher and food safe, it is probably safer to hand wash to avoid accidents.